prepare many teeth for their prospective crowns. 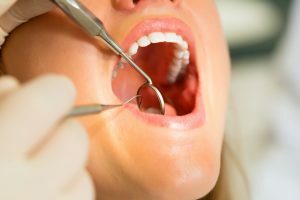 This procedure is considered a relatively minor oral surgery. Concord Smile offers lengthening work as a restorative dentistry service that can help patients in several ways. The process of crown lengthening works to expose more of the tooth in question by reshaping the bone and surrounding gum tissue. Essentially, periodontists cut the gums and tissues in order to contour a healthier, more natural gum line. Cosmetic dentistry. “Gummy” smiles are a common affliction that consists of too much gums upon the teeth, leading to an unnatural appearance. Patients will undergo crown lengthening to improve the aesthetic quality of their smile. Sculpting your gums can help to produce a healthy-looking smile that is both bright and balanced. Restorative dentistry. Teeth are susceptible to damage from both cavities and traumatic injuries. Crown lengthening can be useful for exposing more of the damaged tooth in order to prepare for repairs. This procedure is especially handy for exposing the cracks and cavities that are hiding below the gumline. Overall, this relatively minor surgery is very beneficial for fighting gum disease and future complications. Dental crown preparations. A number of patients will require crown lengthening treatments before they can seamlessly reap the benefits of a new dental crown implant. Having proper space to install the new crown will do much to reduce the risks of damages to the bones and tissues surrounding that crown site. Once completed, patients are prescribed medications and told to rest so that their newly shaped gums can rest and heal. After we have determined that everything has gone to plan, the next phase in dental crown procedures will begin.